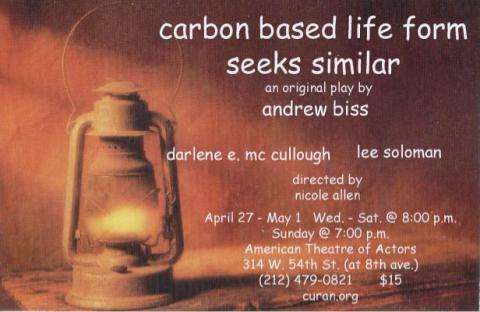 As mentioned in Something New #44, I’ve been in rehearsals for a new play Carbon Based Life Form Seeks Similar as part of the Notes From The Underground Festival. We open next Wednesday and it’s been great fun to rehearse. ...got to do with it? Lee Soloman has been a lot of fun; the dude is hilarious and wonderfully spontaneous. It’s probably all the improv he does ~ and, coincidentally, he and I happened to have been in a random improv show together 8 years ago! I guess that just happens if you do this long enough. 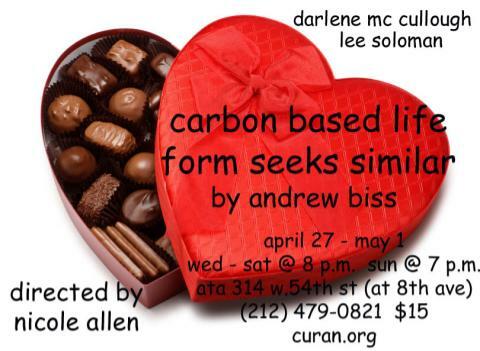 It’s being directed by Nicole Allen who has obviously been drinking the awesome sauce. If you make it to the show you’ll see why; she’s got a knack for painting a stage picture that’s elegant in how simply it’s formed. ATA – 314 w.54th St (at 8th Ave) – call 212-478-0821.